Sometimes your working desk might look a bit messy when you set up a laptop on it. The laptop’s cable, mouse, speaker, modem, etc are scattered on the table and they can be an eyesore to visitors, clients and even your own colleagues. To tidy the mess and organize your laptop setting nicely, you can try out SpaceStation created by Bluelounge. The Bluelounge SpaceStation is a desk organizer or docking port for laptop. There are internal coiling pins concealed under the dock which will be used to thread power cords and cables from various peripherals. 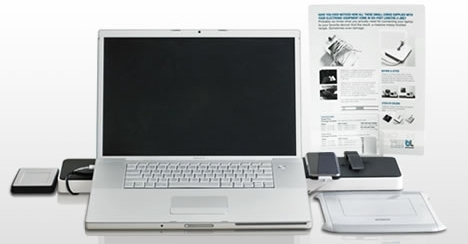 You can also find a four-port USB hub that connects multiple devices to the laptop hidden underneath the docking port. The long and flat SpaceStation hovers just 5mm above the desk so that the cords are free to enter or exit the hub at any time. Users can find a page holder clip at the back of the dock to hold the hard copy while typing. There is one layer of rubber pad laid on top of the elongated gadget. The rubber pad is the place to rest a laptop, raising the back to create an ergonomic keyboard angle and allowing airflow underneath. It is also a surface for placing a phone, and daily accessories for easy access. A rear accessory rail acts as a great business card slot and sports a handy page holder to keep all the paper you want standing upright next to your laptop for easy reference. The extended design will bring the cords to their accessories on the left or right side of the laptop. The computer may be placed centered or offset leaving space for a full letter sized page and other accessories.